Not a home inspection post, but just a suggestion to make your home look nicer. Taking time to make your work professional can be easier when thinking of other ways to do the work. I had cut an old bookshelf in half to create two shelving units in two different parts of the house. One was sliding under a countertop in the kitchen; while the other was going up on a wall above my daughters bed. I had two problems which caused this set up to look a little unprofessional in appearance: the walls are not perfectly level; and the cabinet had rounded edges which highlighted the gap. Most cabinets that are meant to be installed on a wall have a small lip which can be scribed so that the surface of the cabinet follows the wall. It is not really hard to do, but unless you have the skill to make the cut, something goes slightly wrong. In my case, I was taking a unit that was not meant to be used in the way that I was now intending. No wall is perfectly level, so butting my cabinet against the wall would not have worked. Measuring down from the ceiling at different points along the length of my shelf, I found that the ceiling drops down a quarter of an inch over a span of four and a half feet. This meant that there would be a quarter inch gap on one side that would stand out like a sore thumb. Here in this picture, you can see that the rounded edge of the cabinet frame with the uneveness of the wall makes for quite a gap. 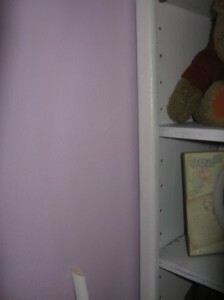 By taking a quarter inch round molding, I can cover over that space. In this picture, I tacked the molding up to demonstrate how it will make for a better appearance. 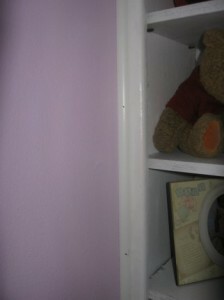 Now, this trick of using molding to cover gaps or mistakes is a great way to make something look as though it belongs. Molding is sold in various lengths, sizes, and styles. I picked a simple quarter round, but I could have used any number of pieces to make that joint stand out. I also used this technique recently on my brothers home. His fascia board had pulled away from the soffit and rafters during the hurricane. I used lag bolts to pull the fascia in towards the rafters, but a small gap remained, so I used a small trim piece there to cover the small gap. The one thing to plan when adding trim to these cabinets is your cuts for corners. I cut one length at a time, then I determine how to make the cut for the corner joint. Sometimes it helps to visualize the cuts, but you could draw them out on a piece of paper. I place the molding in my saw with the portion that I will be looking at facing up. In this way, I can see if I am cutting at the right angle. I fit everything together before attaching it to the cabinet and wall. If you take your time, you can make it look quite professional. Small joint mistakes could be covered up with wood putty. You smooth it into the joint to make it look even, and then you paint. This entry was posted on Sunday, November 9th, 2008 at 5:49 pm	and is filed under Living in your Home. You can follow any responses to this entry through the RSS 2.0 feed.